SMITH CENTER – Smith Center coach Darren Sasse and Plainville coach Grant Stephenson talked after Friday’s contest at Hubbard Stadium. Both squads had first-game issues. The Redmen, ranked No. 1 in Class 2-1A, struggled with four turnovers, especially with fumbling. Plainville, ranked third in the classification, committed two miscues. Each delivered one inside the red zone. The teams combined for 17 penalties for 159 yards. Smith Center, led by its standout defense, delivered the 16-7 home victory against its Mid-Continent League opponent. The Redmen won their seventh straight home contest and moved to 20-2 in its last 22 home games. “Neither one of us saw those kind of things in practice, and that’s why you have got to play a game, and find out what you are good at, what you are bad at, and what you need to get better in,” Sasse said. Last year, the Redmen were also ranked preseason No. 1, though fell to then-unranked Plainville, 20-16, on the road in their first contest. In sub-state, Plainville beat Smith Center, 14-0, at home. Smith Center senior lineman Dalton Kuhn, a returning first team all-state pick, battled cramps throughout the game. Kuhn, offered by Fort Hays this summer, finished with 12 tackles, including 2.5 TFLs and 1.5 sacks. Kuhn provided the final points with 6 minutes, 44 seconds remaining. He rushed up the middle, and forced Plainville sophomore quarterback Jordan Finnesy into intentional grounding in the end zone. The nine-point margin was key when Plainville drove to the Redmen 10-yard line before it turned the ball over on downs with 1:26 left. After a Plainville punt started the contest, Smith Center fumbled on its second offensive play. Plainville had to punt again. A bad punt snap – and tackle for loss from Kuhn – yielded a 26-yard loss. Smith Center converted the play in a five-yard touchdown from Staples. Staples played in six games in ’16 and was a big-play threat with 27 carries for 291 yards and a pair of scores. An athletic, shifty runner, he finished with 20 carries for 141 yards in the depth-laden backfield. In the second quarter, Plainville tied the game at seven on a four-yard run from senior Chase Cellmer. Staples scored on a 40-yard run late in the first half, but the run was negated by penalty. The drive ended in an interception. 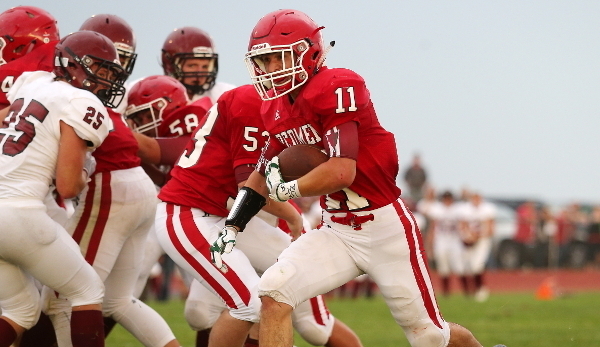 In the third quarter, Staples intercepted Plainville inside the Redmen 10-yard line. Finnesy, in his first career start, led an offense with many brand-new starters, especially at the skill positions. Finnesy consistently evaded tacklers and finished with 19 carries for 39 yards. He completed 6 of 19 passes for 57 yards and the INT. Plainville often used five wide receivers and an empty backfield. The Cardinals frequently ran sweeps. Senior all-state lineman Hayden Gillum occasionally played fullback in a package the Cardinals put in this week, mainly for short yardage. Staples hurt his ankle in the second quarter before he broke through for a 40-yard TD in the third quarter. Kuhn and the defense corralled the Cardinals down the stretch. Smith Center outgained Plainville 257-69, though missed senior lineman Camden Dietz due to injury. Several Redmen stepped up, including junior Josiah Moore. “When Dietz gets back, glad to have him back, but we also have the option to stick someone else in there,” Kuhn said. Overall, the Redmen had four passes defended in addition to Staples’ pick. Haven recovered a fumble for a veteran unit that led 2-1A in scoring defense last year, one spot ahead of Plainville. Afterward, Sasse believed, like last season, Smith Center and Plainville could match up again in late November.